Whether you like it blanched, roasted, grilled or simply crunchy and raw, asparagus is light, fresh and offers a range of cooking and eating possibilities. We’re entering the height of asparagus season, so it’s an ideal time to take advantage of this naturally sweet and easy-to-prepare vegetable. Pick up a bundle or two today, and try adding it to you salads, pastas, sides and more. It will quickly transform your most basic dishes into stunning, satisfying plates. When to Buy: Now is the best time to start perusing the produce aisle to find the first batch of in-season asparagus. Like most fruits and vegetables nowadays, asparagus can be purchased in grocery stores year-round, though February through June is prime asparagus time. What to Buy: When shopping for asparagus, it pays to be superficial – you want your bundle to look good. Each spear should be very firm, a matte green color and free of noticeable bruises. Steer clear of those that are particularly soft, glossy-looking or smelly, as they’ve likely been sitting out for a while. Prep & Storage: It’s best to buy your asparagus within just a few days of cooking with it – any longer and you run the risk of finding yourself with sagging spears. They’ll keep longest in the refrigerator, especially if met with moisture. Submerge their bottom ends in a glass of water or drape a wet paper towel over the unrestrained bundle on a plate. Before eating or cooking, cut off the bottom inch or so of each spear, which is tough and coarse. How to Cook: Though it can be eaten raw and is fabulous featured in a fresh green salad with just a few squirts of lemon and a sprinkle of salt, I prefer it warm, either grilled or roasted. I’ve found that asparagus and Parmesan cheese are a naturally tasty pair, so I like to line up the spears on a baking sheet, drizzle them with olive oil, shower them with Parm and bake them until tender and savory. If you don’t want to use (or don’t have access to) your oven, whip out the grill pan, and cook them for just a few minutes and top with a thick balsamic reduction. 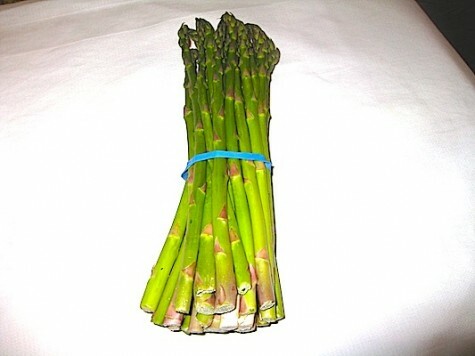 Asparagus is also ideal in a cheesy pasta dish, mixed in a classic risotto or incorporated into a veggie stir-fry. Recipe Box: Check out our favorite asparagus recipes. This hearty salad is dressed with a light lemon vinaigrette. To prepare this three-ingredient side dish, sauté fresh asparagus with fruity olive oil and finish with lemon pepper seasoning. Quickly-blanched asparagus stars alongside soft, creamy burrata cheese and salty prosciutto. This dressed-up appetizer comes together easily, thanks to store-bought puff pastry dough. Pureed asparagus is mixed with fragrant fresh mint and crunchy pine nuts to create a simple, satisfying pasta dish. Maria Russo is a senior at Barnard College and has summer plans to go asparagus-picking in her home state of Michigan. Read more . . .